Family trees were always the worst school projects when I was a kid. We had a big family. And once we got past my grandparents, all of the names were for people I didn’t know. Or maybe I met them once at a family function, but they were either old or dead and I could never keep the names straight. To this day, I remember having an Uncle Mars somewhere on my father’s side. But I couldn’t tell you how he is related to my cousin Jesse the constitutional lawyer, versus cousin Jesse the intellectual property lawyer. Suffice it to say, I’ve never paid that close attention to my own ethnic make-up. Sure, I’m Jewish. There’s some Carpathian Mountains in there, so I sometimes say Russian/Polish if pressed. I can generalize and say Eastern European. And despite having no evidence to support the contention, I like to believe there’s at least a little Italian in me somehow. As long as I’m making up facts to support my theories, I choose to blindly believe that my deep love for certain foods is linked to some kind of latent cultural DNA. Take sauerkraut for example. Actually, you won’t believe where I took the sauerkraut. But I’ll tell you anyway. This story starts all the way back in Pennsylvania. Because there is a great meat shop outside Altoona called Holland Brothers, and the shop has a house-made sauerkraut. Which. I. Love. So, I ended up taking back a quart of it with me. To Albany. Where I am the only one who eats the stuff in my household. And let me tell you, a quart of sauerkraut can last a long long time if you are the only person eating it. Especially, if you are on some stupid diet and aren’t eating lots and lots of fatty sausages. Because that’s a brilliant way to go through a ton of finely shredded, fermented cabbage. Here was my diet friendly plan for how to eat the kraut. Use meat as a flavoring, and eat the cabbage much like a stew. I’m pretty sure the Polish name for this is kapusta, which as far as I can tell, is some kind of medley of sauerkraut and meat. There can be other vegetables in it too, like onions or potatoes. It seems like it can be dry or wet. But I really have no idea. Growing up this was never a dish I was served. Mostly, because I’m not actually Polish. 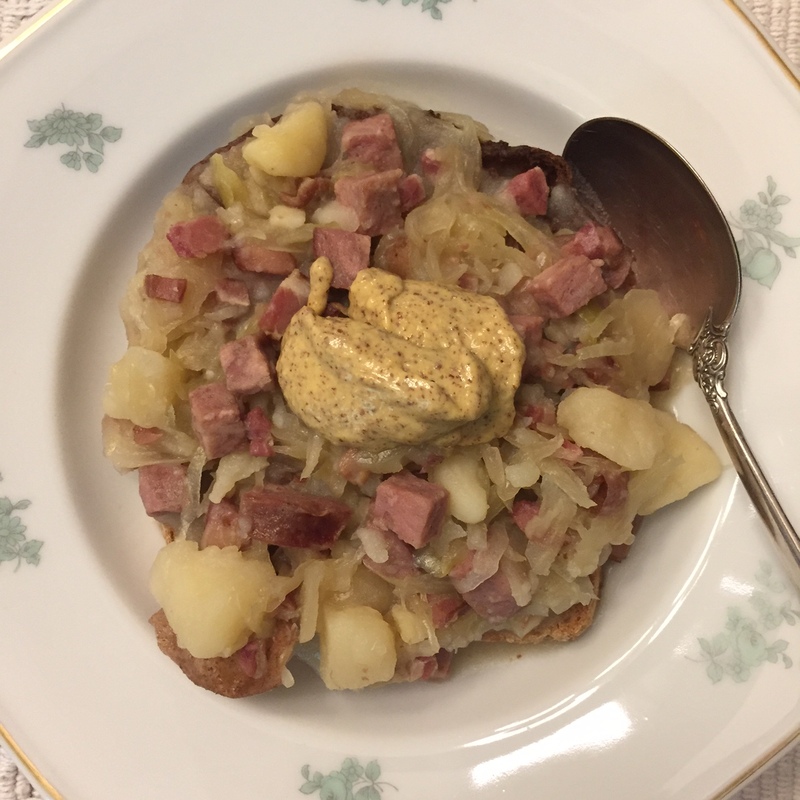 And even if I was, the Polish Jews would have likely shunned the dish because of all the pork products it contains. Right. So there I was at Chester’s Smokehouse picking up a little treat for Little Miss Fussy. She still loves the smoked veal loaf Chester and Ken make on site. It’s like bologna, but even better. And with some American cheese on squishy bread, it’s one of those real special treats the kids will sometimes get for lunch. Oh. Hello bacon ribs. You look like you would be perfect mixed with my bucket of kraut. And so did a chunk one of those fat links of house made kielbasa. I went for the double smoked because I wanted to put as much flavor into the vegetables using as little meat as possible. Stupid diet. And that we were supposed to bring something. Was she horrified at the notion of bringing a sauerkraut stew over to a coworker’s house? Yes. Yes, she was. And I have to admit, after smelling the slow cooker, it was a pretty pungent affair. In the end, I ended up tossing some boiled red potatoes, and a bit of homemade chicken stock into the pot for good measure. And I brought over some strong Polish mustard that I also picked up from Chester’s. Amazingly, it was a success! I got to enjoy two small plates of it at the party. Plus there was just enough left over for me to eat one final taste of it the day after the event. To make it even better, I found out our hostess for the party was even part Polish. For real. And she loved it! Mrs. Fussy was relieved, but I suspect she was still a little bit horrified. Frankly, I felt exactly the same way, maybe with a little bit of vindication thrown in as well. For what it’s worth, the diet is actually going much better this time around. Maybe one of these days I’ll tell you about the new cruelty. But not tomorrow. Tomorrow I owe you tales of cocktails. They actually make and sell their own kapusta at Chester’s Smokehouse. I love one pot meals – lovely!!! YUM.